DETROIT — Nissan, which helped pioneer the mainstream electric vehicle market with the Leaf, is reimagining the EV. The IMs, unveiled Monday at the Detroit auto show, looks like a sedan, but offers seating similar to that of a crossover. The all-electric concept car offers a higher ride, stretched interior and pivoting seats. The IMs is less blueprint for a production vehicle and more a showcase of technologies and concepts Nissan is experimenting with as the automaker plans for a driverless future. Electrification goals account for the bulk of the new product plans as Nissan responds to an onslaught of electrified entrants. Nissan plans to launch eight new EVs and generate annual sales of 1 million electrified vehicles by 2022. 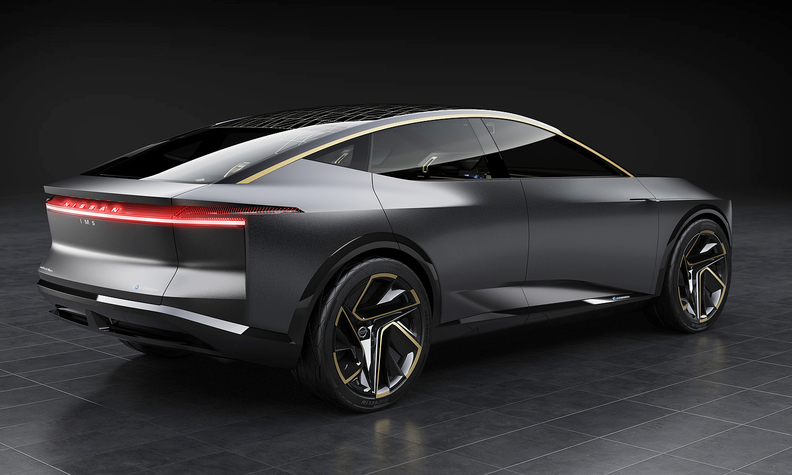 "Advances in electric vehicle technology and autonomous driving have allowed our designers to break free of the platform and packaging rules that constrain traditional passenger vehicles, to create a completely new type of car," Alfonso Albaisa, senior vice president for design at Nissan, said in a statement. The all-wheel-drive IMs' is powered by dual electric motors (front and rear) and a fast-charging 115 kWh battery that generates 483 hp. The IMs has a robust driving range of about 380 miles (612 km) on a single charge. The exterior — more sharp edges than sculpted surfaces — features a long wheelbase and waistline, cabin-forward A-pillars and sloped rear-window angle. It's about range-squeezing efficiency as much as about design flourishes. The forward A-pillar and extended C-pillar locations result in a low drag coefficient. Various body panels, including the fenders, front spoiler, rocker panels and undertray, provide downforce and minimal lift at high speeds. The B-pillar-less 4-door body includes reverse-opening rear door, invisible door handles, and that staple of concept cars — wing cameras in lieu of outside rearview mirrors. The wing cameras fold when the IMs is in autonomous mode. In a nod to its Japanese lineage, the IMs' smoked-glass roof surface features a geometric graphic inspired from a traditional Japanese pattern called "asanoha." The interior uses darker materials in contrast to the lighter exterior. The instrument panel and door panels are covered by woven black material with fabric gold mesh accents. The gold details, found throughout the interior, provide elements of light in the way Japanese paper door screens provide light for traditional Japanese tatami rooms. Like with most electric vehicles, powertrain components in the IMs are tucked under the cabin floor, giving designers the flexibility to imagine a lounge-like interior. "With the raised, flat-bottom platform and absence of interior restrictions, there's a sense of almost levitating, as if you're riding on a magic carpet," Albaisa said. The IMs features a "2+1+2" seating architecture with pivoting front seats and a rear seat that either offers three-across seating, or, once the slim rear outboard seats are folded, an executive-style "Premier Seat" in the rear center. The interior of the IMs is tuned for a driverless world. In autonomous driving mode, the steering wheel retracts and the front seats pivot inward to face the rear seats. The dashboard is dominated by a large, thin instrument panel with four screens and a retractable steering wheel. Directly in front of the driver, is a layered instrument cluster. A suite of sensors and cameras monitor the driver's condition, interpreting facial expressions and body posture to determine if the driver is unable to continue driving. Active in both manual and autonomous drive modes, the monitoring tech can bring the IMs to a controlled stop if the driver is incapacitated. The IMs features mixed-reality technology that Nissan says allows the driver to "see around corners." Dubbed Invisible-to-Visible, the three-dimensional interface merges information from sensors and the Internet to track the vehicle surroundings and anticipate what's ahead. The technology can displaying what's behind a building, or visualize information about traffic jams — including causes — and calculate alternative routes.